Gillette makes a popular line of men’s safety razor blades, but they do have many products for women too. 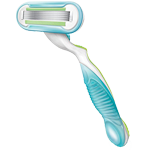 The Gillette Venus Embrace is a classic safety razor with handle and replaceable blades. The Venus brand was their first women’s razor and has been around for several years. They have several attractive shavers in their line. It comes in an attractive white, aqua blue, and lime green design. The back of the razor is in an aqua blue colour. The handle has an anti-slip grip with small indentations along handle and side, so you can grip it more easily in the shower. The head that contains the razor blades is lot wider and longer than your traditional disposable razor blades. It has an enhanced grip. 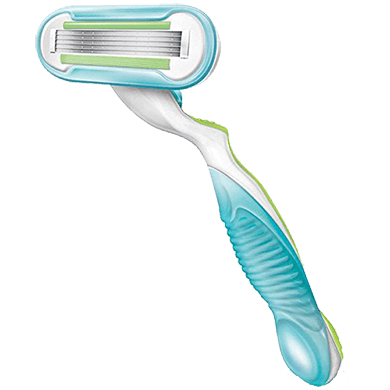 The handle of the Gillette Venus Embrace is meant to be reused, and you can insert new blades when the old ones start getting dull. 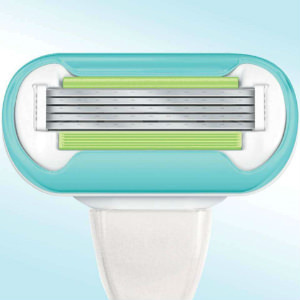 The wider surface of the blades makes shaving your legs an easier experience. There are several rows of blades built in, with a total of five, so if the first blade doesn’t get all the hairs, the consecutive blades will be sure to do so. 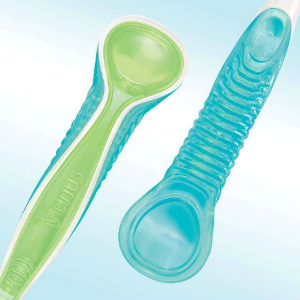 The handle also has a gentle curve to it, so it is easier for you to shave your skin. 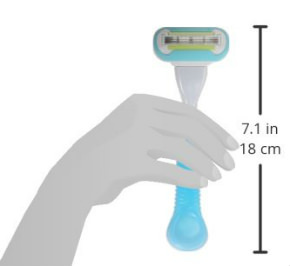 It has a soft grip finish, so it’s not only anti-slip but it will feel comfortable in your hands even if you’ve decided to shave your entire body. In each of the razor blades are also two Ribbon of Moisture comfort strips that are filled with lotion. As the razor gets wet, there will be moisturizers that melt from these strips, and they add an extra bit of glide to help shave your legs. This extra moisture will also minimize the nicks and cuts that you can get from traditional razor blades, especially when compared to the original Venus three blade razor. Each blade promises to hug your curves so shaving is simpler. 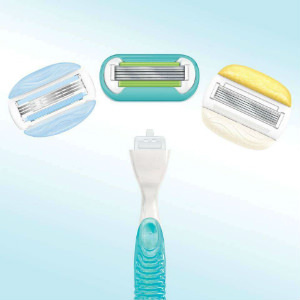 The Venus brand also promises that your skin will stay smoother for longer than if you used a women’s electric shaver. You can use it to shave everything from your face and down to your toes. It’s suitable for bikini line shaving, and the Ribbon of Moisture will make that an easier shave. Buy only one product to shave your legs or anywhere else you want. 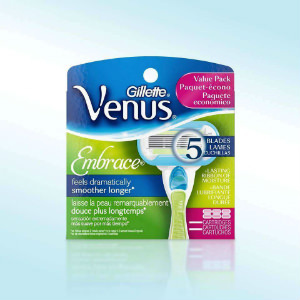 You won’t need to shave as often with the Gillette Venus Embrace. You can still shave with water, soap, and shaving gels, foams, and creams too. Maintenance of the Venus is simple—simple rinse under the tap and let it dry on the edge of your bathtub. You can use any shaving product you wish, but for best results it’s recommended that you use Satin Care or Venus Shave Gels. 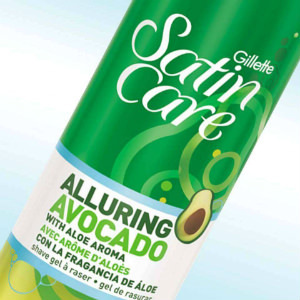 The Gillette Satin Care gel is made with alluring avocado and aloe vera, two natural ingredients known for their moisturizing and soothing properties. 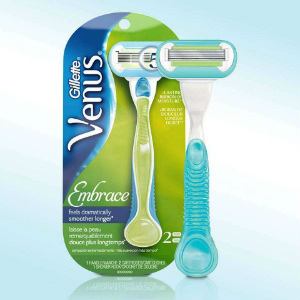 The Venus Embrace packaging comes in an oval/rounded corner design, with blue and green graphics. 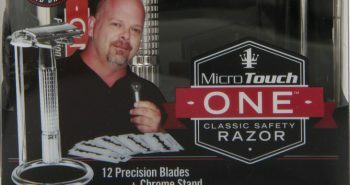 One razor handle and two blades will cost about $16. The Venus measures 7.1 inches tall or 18 centimetres tall. It’s easy to swap out the razor blades. You can also choose any type of Venus razor blade, as they make many different types. One type of razor blade that’s recommended to be used with your Gillette Venus Embrace is the Gillette Venus Embrace ShowerSafe Razor Cartridges. These are sold in four and eight count packages. The Venus Embrace comes in a package that measures 2.2” x 2.2” x 8 inches and weighs 1.6 ounces. This product is light enough to pack in your luggage for a trip, without having to worry about the additional weight from an electric shaver. Also, no worries about correct voltage or plugs. The safety razors are also safe to bring on a flight. Reviews are positive for this product, with 4.3 stars out of 5. Many women may wonder at the difference between the Embrace and the Olay, Quench, or Breeze. 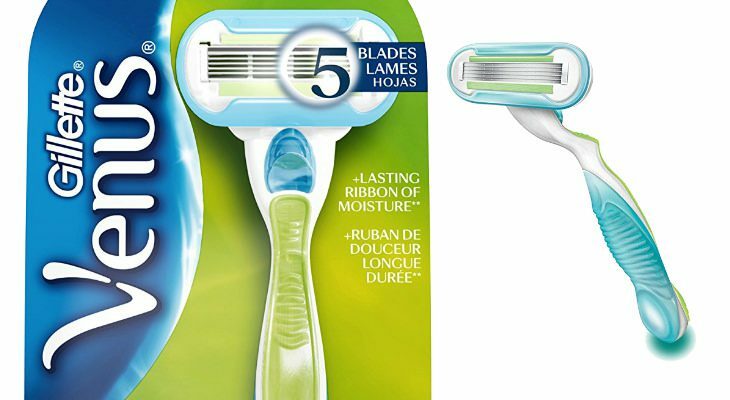 The Embrace and Olay have 5 blades, while the others have 3. There are also differences in colour and scent. 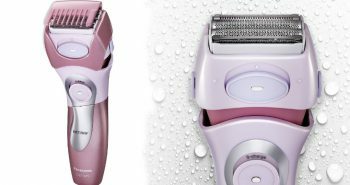 If you’re a woman who prefers to shave with a safety razor rather than an electric shaver, you’ll be pleased at how well the Gillette Venus Embrace Women’s Razor can shave your legs and other regions of your body. It’s fun and simple to use, and takes up little space in shower or luggage.